Hugo Uyttenhove completed his third mystery/adventure novel The Da Vinci Cloth based on an earlier scresnplay he wrote for Writers Boot Camp in California. 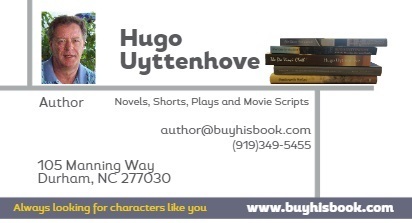 He also published his first murder mystery book in a series called The Carolina Arbors Murder Series in which he invited several guest writers. He is currently working on a short story based on his father's WWII diary, and is translating a book by Jan van Raemdonck about a coversation of Anne Frank, Rembrandt and Van Gogh that takes place at the Madame Tussauds museum in Amsterdam. Hugo Uyttenhove was born in Belgium and had lived in the U.S. since 1968. His first mystery novel Grand Scale Larceny - The Heist of the Flemish Primitives was published in 2011. At that time he joined Writers Boot Camp to study script writing. He wrote several film scenarios as well as a TV-pilot, the latter based on the main character of his second novel, Rembrandt Redux. In his writings, the author includes experiences from his travels to over thirty countries, his language skills and his passion for all things Flemish and art. He currently resides in Durham, North Carolina with his wife.